Puppies are just as omnivorous as their adult counterparts and as such can happily thrive eating an all-vegetable diet. If you want to avoid feeding your puppy meat or animal products, then BiOpet Vegan puppy food will satisfy your puppy's needs. Biopet Vegan Puppy Food is produced without the use of animal proteins and relies on nutritious vegan raw materials. Biopet Vegan pet food does not contain chemical additives or preservatives. Australia's Fully Credited Vegan Puppy pet food - Independently audited, Biopet Vegan Puppy Food is fully vegan credited. Promotes Healthy Coat and Skin - Omega3 and 6 fatty acids help promote healthy skin and a shiny coat. No Added Sugars, Artificial Colours, Flavours or Preservatives - Nothing artificial in this complete feed. 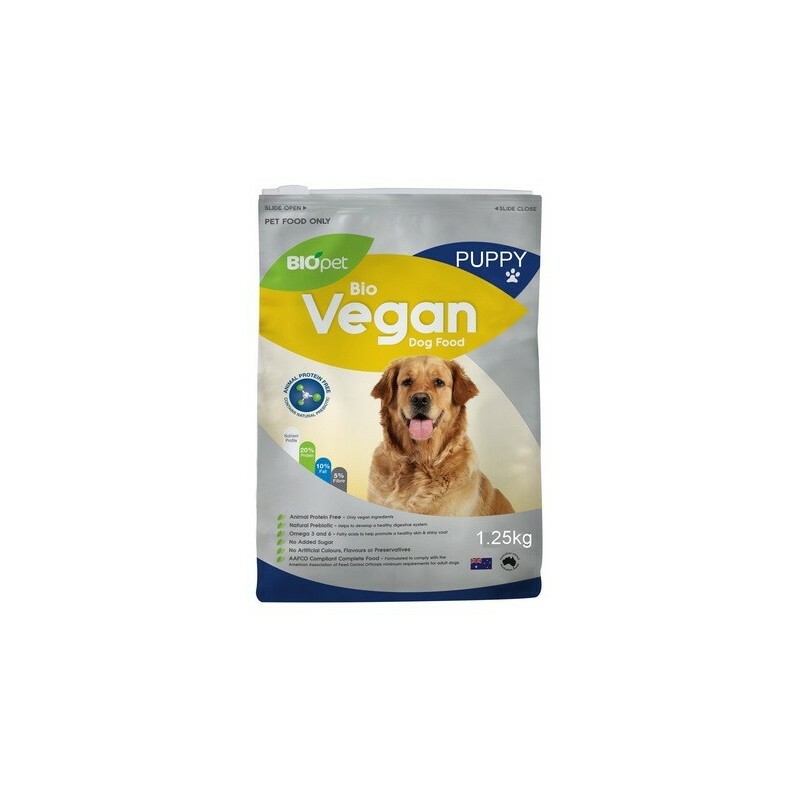 Animal Protein-Free - Only nutritious vegan ingredients used, Biopet VEgan Puppy Food is Australia's premium vegan dog food. Helps Immunity - Contains natural probiotics which help maintain healthy immunity levels, by promoting a balance of healthy flora in the gut. AAFCO Compliant Complete Food - Formulated to comply with the American Association of Feed Control Officials minimum requirements for puppy dogs. Biopet has invested over 25 years of expert knowledge and experience into formulating Biopet Vegan Puppy Food. 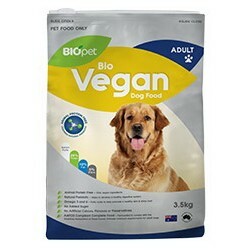 Biopet is a wholly Australian Owned Company and Biopet Vegan is proudly made in Australia. Ingredients: Wholegrains, malt, cereal meals, rice, field peas, soybean meal, sunflower seed meal, green beans, maize gluten, Wheaten millmix, vegetable oils, limestone, dicalphos, molasses, alfalfa, carrots, yucca extract, potatoes, seaweed meal, garlic, iodised salt, vitamins, trace minerals and natural antioxidant. STORE IN A COOL AND DRY PLACE. Please ensure your dog always has access to fresh and clean water at all times. Grams per day. Guide only - Vary according to the puppy's condition. Preferably give the daily quantity in three separate feeds. Dogs are omnivores and as such can happily thrive eating an all vegetable diet. 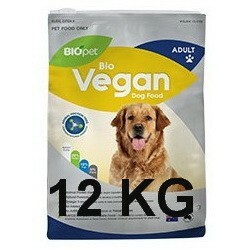 If you want to avoid feeding your dog meat or animal products, then BiOpet Vegan dog food will satisfy your dogs needs. Dogs are omnivores and as such can happily thrive eating an all-vegetable diet. If you want to avoid feeding your dog meat or animal products, then BiOpet Vegan dog food will satisfy your dog's needs. 100% LIP LICKING GOODNESS For the non-meat eating furry friends, or for those just wanting to try something a little different. Of course, they still taste fantastic! 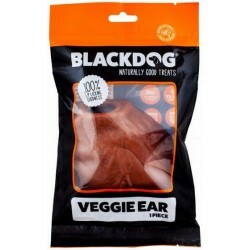 Your pooch can bust boredom and chew away at Veggie Ears for great dental hygiene.